These love letter cupcakes are easy to put together and are perfect for a large crowd or party. 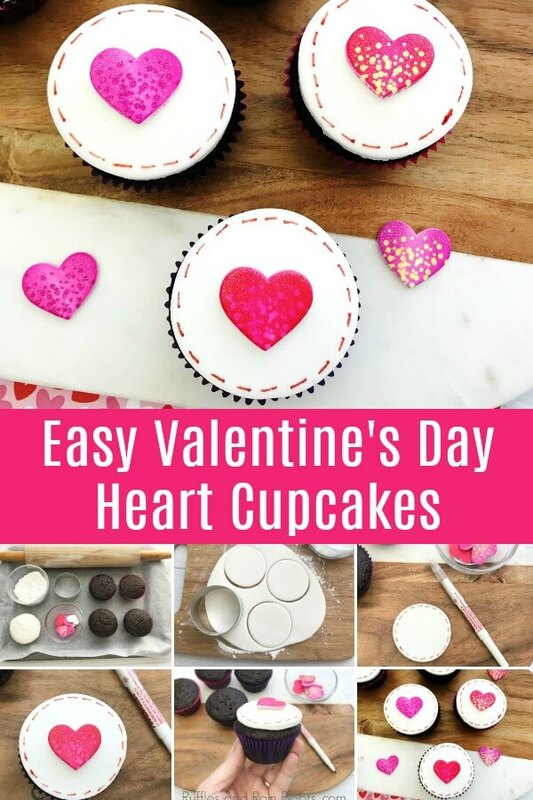 Let’s get started making these elegant heart cupcakes. Here at Ruffles and Rain Boots, we like to share some pretty amazing cupcake decorating ideas. My goodness, we’ve shared so many Valentines Day cupcake recipes already! This week, I thought we could make a very different type of cupcake – one that is a bit more “grown up” but still fun. 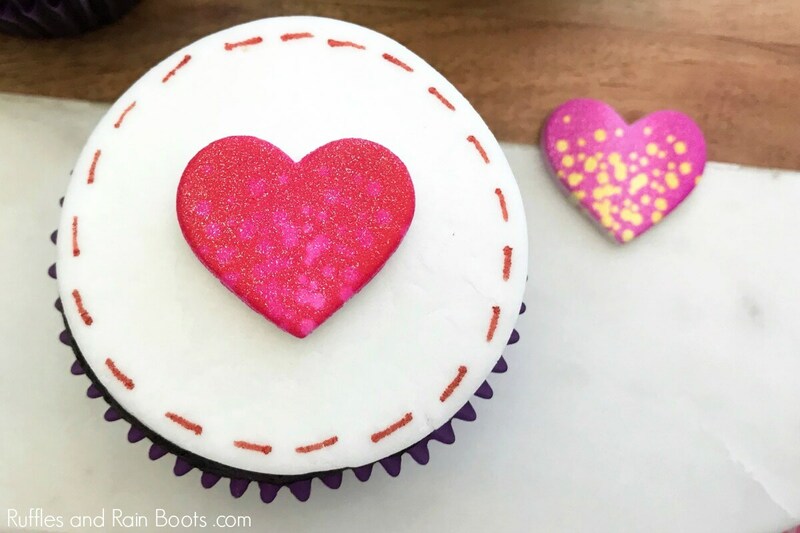 This love letter cupcake idea is perfect for a sweet treat for adults or if you have an older child hanging around the house. Psst: this one is also one of the great class party cupcake ideas because it’s super-duper easy. So that’s nice. Let the cupcakes cool completely before frosting them. Warm frosting runs. It’s not pretty (and it won’t hold the fondant well). Be sure to coat your smooth surface with cornstarch. Fondant sticks like crazy. Don’t roll your fondant too thin. It’s the biggest mistake we ALL make when learning. 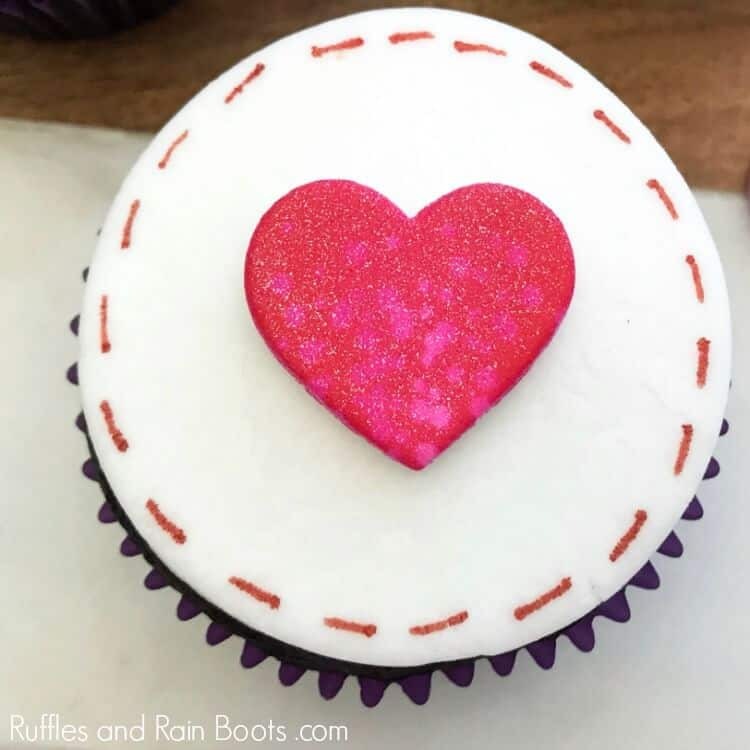 Note: if you’re creating a Valentine’s Day cupcake playlist on YouTube, here is our video of all Valentine’s Day cupcakes on Ruffles and Rain Boots. I’m lazy. Well, not true. I’m just interested in doing ALL.THE.THINGS! with the time I have. 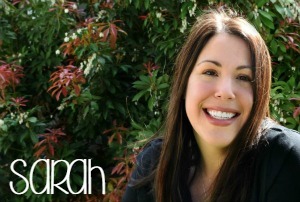 I love to craft, play with the kiddo, bake, write… Let’s just say I fill my days. Because of that, I’ve learned how to make the best vanilla cupcake recipe that will turn out every time. 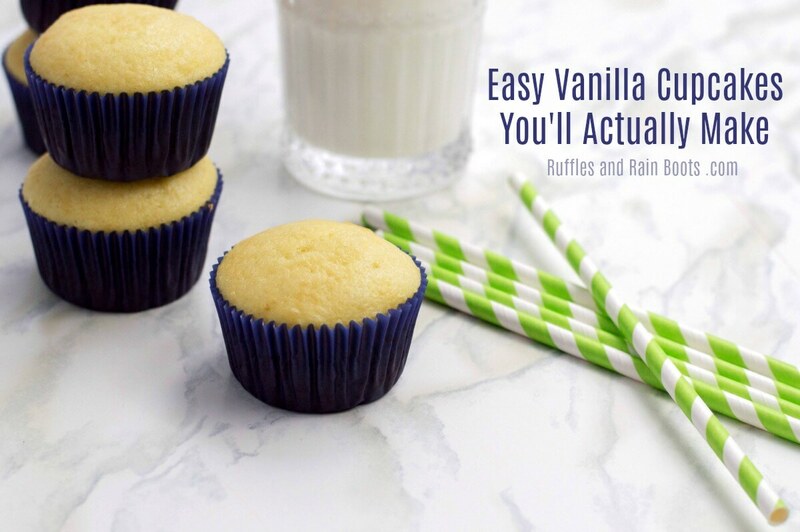 This is a recipe for 12 vanilla cupcakes which can easily be doubled. 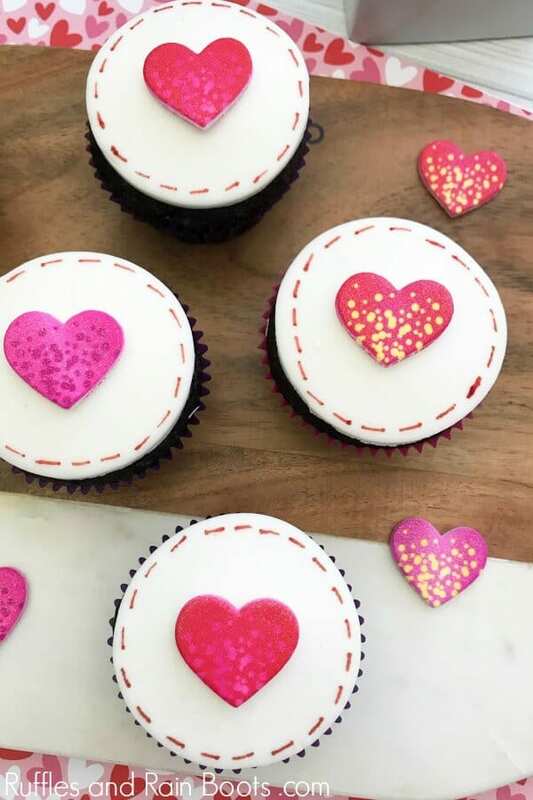 These grownup love letter cupcakes are a quick Valentine's Day cupcake. With a chocolate cupcake and an easy decoration, they're a crowd-pleasing Valentine's Day dessert. First, make the cupcakes. Preheat the oven to 350 degrees F and line 2 muffin pans with cupcake liners. Combine flour, cocoa powder, baking powder, and baking soda in a medium bowl. Set aside. Combine the sugar, butter, eggs, vanilla, and milk in a large bowl. Mix until incorporated and then fold in the dry ingredients. Transfer to the cupcake liners and bake for about 16-18 minutes or until a toothpick comes out clean. While the cupcakes bake, let's make the fondant caps for our love letter cupcakes. Working with a small bit of fondant at a time (no bigger than your fist), roll out the white fondant on a coated surface (powdered sugar or cornstarch) until it's 1/4 inch thick. Cut out circles with the biscuit cutter and set on a parchment-lined baking pan. Leave for about 30 minutes to set. Next, combine all frosting ingredients into a stand mixer or large bowl and mix until smooth. No need to transfer to a piping bag, as you can use a spoon to spread onto the cooled cupcakes. 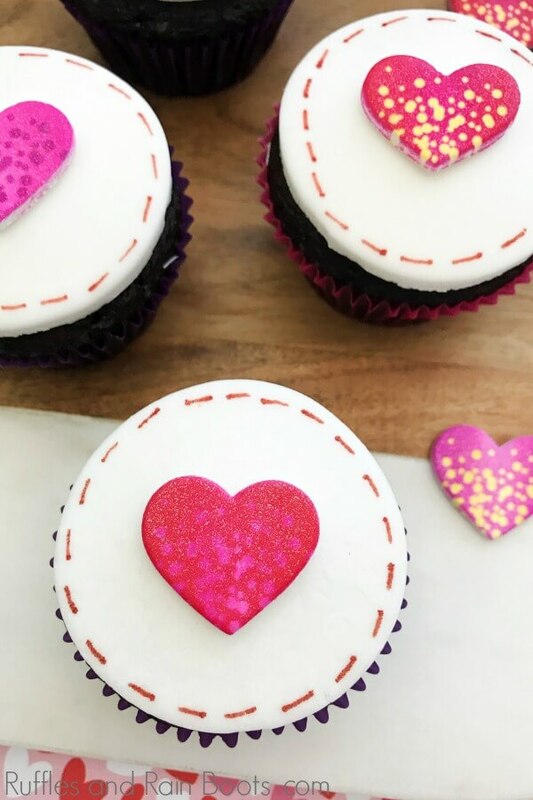 Finally, use the food marker to create stitches around the outside of the circle and use a small dab of icing to attach the heart decoration. Ice the chocolate cupcakes sparingly and place a fondant letter on top, pressing slightly. Enjoy your adorable love letter cupcakes! Pretty and Pretty Dipped Marshmallow Pops – Gorgeous and looks great in a bouquet! 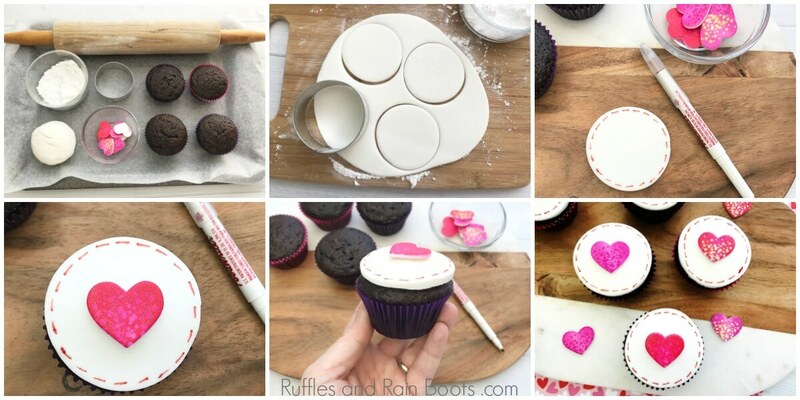 Kid-Friendly Love Bug Cupcakes – Valentine’s Day cupcakes can’t get much cuter. Poop Emoji Cupcakes – Funny and adorable, this one you have to see! Your shares are how this site grows and I am sincerely grateful when you save to a Pinterest board or share on Facebook.